Entries are now open, and preparations well underway, for Stonehaven’s 2016 Half Marathon which will take place on Sunday, July 3 at 10am. This popular local race will see a big change this year as the route has been significantly altered to remove the Slug Road section, but it will start and finish at the event’s traditional home of Mineralwell Park. Runners will leave the town in the same way as earlier years, climbing out of the town past Spurryhillock and upwards into Swanley. On reaching the top of Swanley they will be faced with a three-mile off-road section along wide but undulating forest roads before re-joining Swanley Road and retracing their steps until they cross back over the by-pass. The last two miles will then take runners down Broomhill Road, across and up Kirkton Road where they then turn into and along Farrochie Road. The final mile is downhill all the way, past Mackie Academy and into Mineralwell Park from the Glebe Path and into the finish for a well-earned medal. The changed route brings with it a bit more of a climb and downhill which will add to the already challenging race in the Mearns local sporting calendar. 2015 saw a record turnout of 370 competitors take part in Stonehaven’s Special Anniversary 30th Half Marathon and event organisers are planning for a similar turnout this year with over 110 already signed up. The race has always enjoyed a mix of club members, fitness runners and first-time fun runners and is put on with an objective of encouraging participation from the local community. There are placing awards for first, second and third male and female along with special age category medals. Information about the race can be found at stonehavenhalfmarathon.co.uk and entries can be made at www.entrycentral.com/stonehaven-half-marathon. There are no on the day entries and there is an entry limit of 500 places. The price for this year’s race is £21 (£19 for entrants who are affiliated to Scottish Athletics). Organisers are also planning a commemorative neck tube for all finishers and hoping for the traditional free swim at the Open Air Pool on the day for runners and a spread of refreshments at the end of the race for entrants. In addition to the half marathon the day will also feature the childrens’ Specsavers 1k Fun Run which is free to enter and takes kids around Mineralwell and finish under the same gantry as the half marathon. John Ritchie is on the organising committee and explained more about this year’s race. He said: “Changing the route has brought with it a lot of extra administration and it’s important to give thanks to all the team at the Half Marathon Committee and recognise the help that Police Scotland, The Council Roads team, The Stonehaven Running Club and the Forestry Commission have given in getting this new route in place. “I am delighted that the route will keep the traditional start/finish at Mineralwell Park which has been such a popular location with our runners and their families and supporters. “Unfortunately we cannot make the Stonehaven area any flatter, but all the runner’s efforts will be rewarded with some fine views along the way and I’m sure the people of the Stonehaven will still come out to give a cheer. 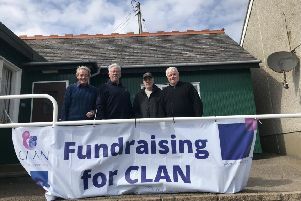 Stonehaven Half Marathon is a not for profit event and like last year the race will be raising money for CLAN Cancer Support. Information about the race can be found at stonehavenhalfmarathon.co.uk and entries can be made at www.entrycentral.com/stonehaven-half-marathon. The committee would also be very interested to hear from local community members who will not be running but would like to assist with marshalling on the day. Please contact marshals@stonehavenhalfmarathon.co.uk if you are interested .